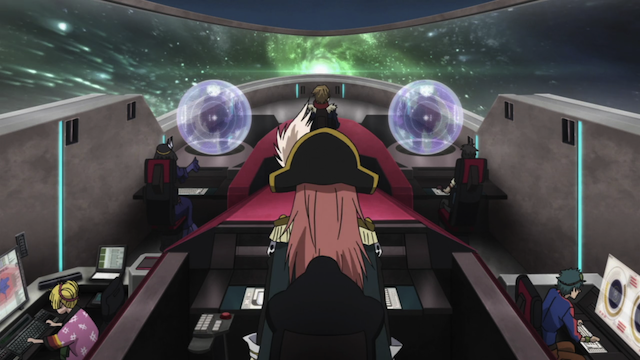 Cross-view of the bridge of the space pirate ship, Bentenmaru. Episode 7 of Mouretsu Pirates (AKA Ferocious Pirates, AKA Bodacious Space Pirates, AKA …) has two main threads, in one Captain Marika Katou’s struggle to be good at a bit too much is explored, in the second a routine pirate job ends up with unexpected consequences. Since this is only the second episode in which we have seen the Bentenmaru in action, I’ll also have something to say about ship duties. This week we got two very different space battle sequences. As the episode opened, Marika leaps into a single-person craft and scouts out a mysterious planet, which ends in her being attacked by overwhelming force and ultimately woken by her friend Mami. Yes it was all a dream, but it turns out to be an opening to an exploration of Marika’s self-imposed pressure to succeed on a seemingly impossible scale. Now that she is pirating, her grades are dropping, but whereas another person might drop out of school and focus on the captaining of a space pirate ship, Marika insists on graduating from high school. In fact, she also insists on keeping her part-time job at the maid café. Now this seems crazy, and in a conversation with Chiaki, Mami reveals that Marika has kind of an inferiority complex related to her mother. Basically Marika’s mom is so awesome, that Marika has outrageous expectations for what she should be able to accomplish, so she is always pushing herself to the very edge. View of the Bentenmaru bridge from the rear. Notice the view out into space during FTL travel. In my last post, I took some guesses about the bridge crew stations and responsibilities. The biggest thing we learned this time is that the area to the captain’s right is Misa Grandwood’s station. I’m not sure if this is normal or a result of Marika being in training. I guessed that Coorie was dedicated to electronic warfare, and she definitely has those duties, but she also seemed to act as a communications officer. I also had guessed that Hyakume was head of engineering, and in this episode we see him running a ship-wide diagnostic for the presence of explosives, so I think this is pretty accurate. I wasn’t sure who had responsibility for the ship’s weapons systems, and in this episode they were under Schnitzer’s control. Luca’s exact role is still a bit mysterious. I still think she is tapping into a variety of sensor systems, but I would like to learn more about what exactly she is doing. The passengers on this week's target had the same excited attitude, like the pirate attack was just a part of the trip. Space pirate Captain Marika Katou relaxes in her private quarters. There was an odd juxtaposition in the two space battles. In the dream space battle, Marika is at first enthused, and then panics when the shooting starts, because she might be in over her heard. 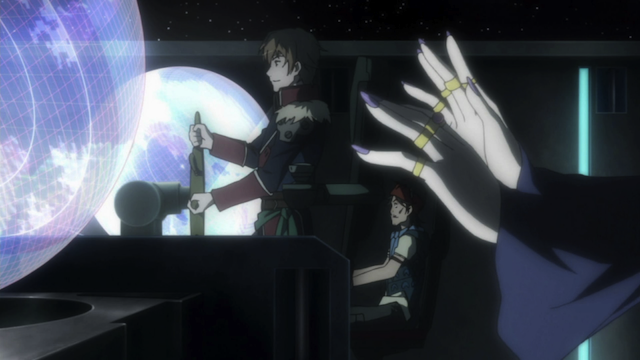 In the real space battle, Marika is almost bored with the situation at first. She wonders if she should shut off the alarm. It is only when things start going wrong (deviating from expectations) that she seems truly engaged. The pirate job this time is even more blatantly a drama. 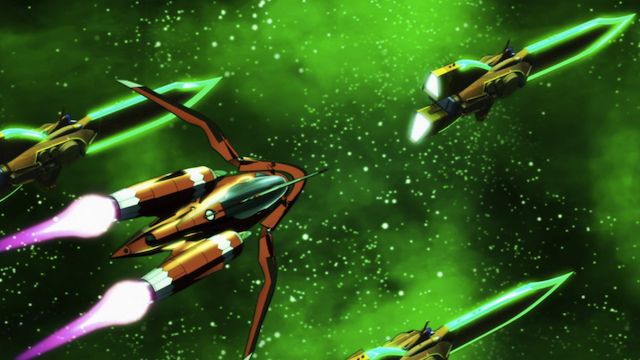 The Bentenmaru has been contracted to attack by the company that runs the luxury liner. In fact they have paid for an “optional package”. The pirates are to exchange fire with three guard ships prior to boarding. The passengers of the luxury liner are thrilled when Marika bursts through the hatch, demanding their valuables. The cynicism of this situation is still a bit surprising to me, although I can imagine that jaded rich people would go on adventure cruises with precisely the hope of being attacked by pirates. After all it isn’t much different than going on a “safari” and hoping to be “attacked” by a lion or a rhinoceros, when one is safely ensconced in an armored vehicle. A visitor from outer space. Unfortunately for Marika, who wants to hit the books (it’s a school night! ), something went wrong during the ship boarding. Somehow someone managed to slip on board, and the episode ends with the intruder demanding to negotiate directly with the captain. I’m pretty happy with the way this episode ended. Again we have a twist that I wasn’t expecting. I think this new character could be important for the direction the show heads in from here, but we’ll have to wait until next week to find out more. "There are times when trying harder isn't enough." 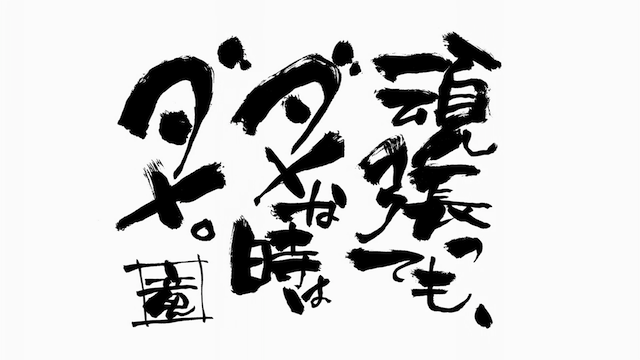 Each episode ends with a quote from the dialogue in calligraphic presentation. I think this is very classy. Just another part of this show that I like. 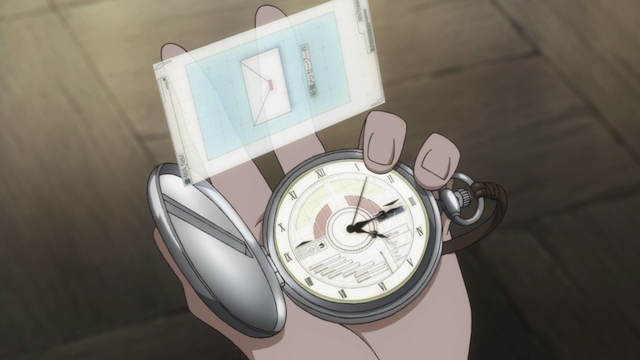 Analog pocket watch with a holographic email display. This phone looks like it was made in the 1920s. It has a rotary dial AND a holographic display screen. I’m probably not using the term “holography” correctly here, but Physics is beyond my ken, so feel free to correct me in the comment section below. No, I think the term’s appropriate in these two instances. You have to wonder if some of their “longer jobs” — the ones they’re not doing now because of Marika’s constraints — might be a bit more on the serious side. On another site someone was complaining they didn’t like Marika’s character because she was too “perfect.” I think this episode dispels that rather superficial assessment. For a minute there, I was beginning to wonder if this setup wasn’t a trap…that they werre actually going to be attacked. Didn’t happen this time, but I wouldn’t be at all surpised if that’s not something that happens in the future. The phone call from Chiaki’s dad was very interesting and, I think, indicates a turning point in the show. Things are going to start turning darker soon, is my guess. RE: “long jobs”, I was actually thinking the same thing. They are picking easy jobs because of the situation, so we don’t know what their normal jobs really are like. RE: “too perfect”, I completely agree with you. There was already a suggestion in previous episodes that something was driving her to go to space, and here we get a much clearer indication that she is struggling with self-doubt. I wonder if Chiaki is in a similar situation. After all, her dad looks like he is pretty damned impressive, and apparently she calls her dad, “Captain”. She seems to be overcompensating, and struggling to be more than an ordinary kid herself. Which gets to the phone call. Something is up, but what? It appears Chiaki was planning to leave (she looked like she was at the airport), but the expected pick-up was cancelled abruptly. Oh, I love you, you unpredictable space pirate series. It zags when I expect a zig, goes straight when I expect a zag, and gives a cheerful raspberry and a childish taunting of “Nya nya” when I expect it to go straight. My glee knows no bounds. I find myself looking forward to real missions later, when Marika has progressed beyond the “milk run” level of being a space pirate. It’ll be interesting to see how she deals with longer missions while still in school; if she’s still in school for them. I really like Chiaki, and it’s so amusing that she’s not fooling anyone about Marika. She’s also the ‘type’ of tsundere character I like the most. She’s cool/cold/standoffish, but clearly awkward about her ‘softer’ emotions. She’s not violent (which IMO has become way overused in the last 5-6 years), but she can still put you in your place with a scathing glare that leaves you wondering why people aren’t commenting on the burnt smell when the poor target character walks by. She’s of the ‘Rin Tohsaka School of Tsundere Characters’ rather than it’s sister-school the ‘Louise Valliere School of the Violent Tsundere’. Her talk with Marika’s best friend was both amusing and cute. She’s so very stubborn, hehe. Just to comment on something you mentioned in a reply, Chiaki does address her father as Dad (actually probably closer to Daddy since she uses Oyaji instead of Otousan) while talking to him on the phone about the things she bought for him. It’s only after something happens that she changes how she addresses him to ‘Captain’ (in English too). I’m guessing his tone of voice and attitude changed from ‘Daddy’ to ‘Your Captain’. It’ll be interesting to see why. I’m really hoping this is a testing of the waters thing, and that it gets the positive response they want to see so that a second season gets green-lit. I definitely agree with you that this series is wonderfully unpredictable. I also agree with your comments on tsunderes — especially the over-use of violent sub-type. I rewatched this episode again (with a different sub) and noticed more or less what you mentioned about “daddy”. Chiaki switches tone at the end of the phone call, and then says something like, “something is happening”. She probably calls him Captain under certain circumstances. I think her relationship with her dad is an interesting subject, and it looks like they are going to reveal more about it. Finally, it would be great to hear that more Space Pirates are coming our way in the future. I really like the multi-episode arc to the stories (principally based on episodes 1-5). It gives them time to set something up, develop it, and then give it a proper conclusion. I love the technology in Mouretsu! 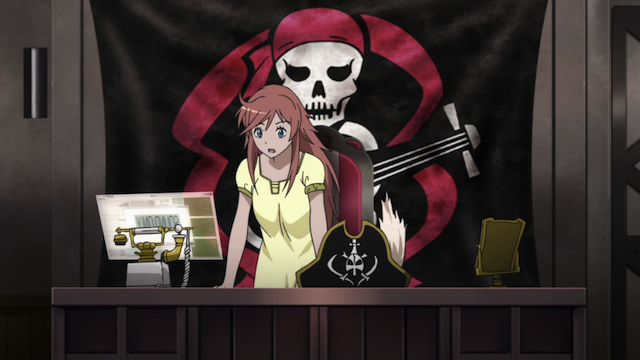 The pocket watch and the old school phone in Marika’s captains room? Really amazing and it makes me want them right now. So the introduction of the princess character! I guess you could say new arc unlocked? Possibly pushing the Bentenmaru into some real battles soon? I imagine things might get real soon for Marika. Mami! I love that character, I wish she was joining the Bentenmaru crew, but I really can’t see that happening it doesn’t seem to be a great place for someone like her. I would love one of those watches, although I would probably lose it or drop and break it like I do with all mother stuff. I agree, the princess is probably going to kick this into the next gear. 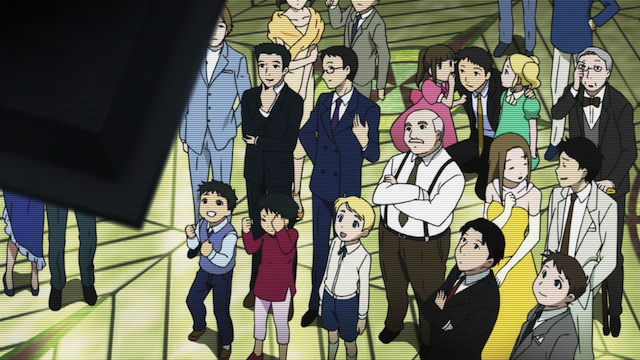 Mami: you never know, she is surprisingly prominent in the ED.